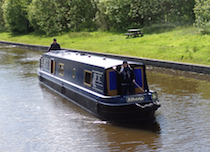 The ATH4 class canal boats. There is full radiator central heating on the boat. A stainless steel water tank supplies the hot and cold running water. Radio/CD player and bluetooth sound system, Colour TV/DVD player with USB socket for film playback. 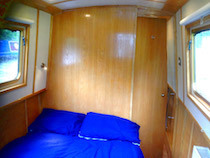 Freshly laundered bedding is provided for each crew member, and towels are also supplied. 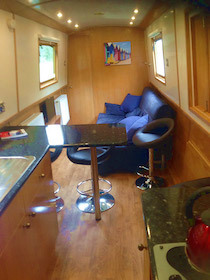 The kitchen is fully equipped and has a Gas Cooker with 2 rings, an oven and grill ; refrigerator/freezer, sink and drainer, kettle, cafetiere; saucepans, cooking utensils, crockery and cutlery for the number of berths. 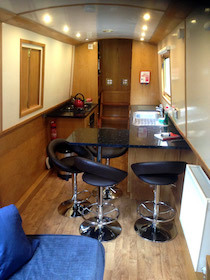 There is plenty of storage space and work surfaces, and a breakfast bar with bar stools. The full width spacious bathroom comes complete with bath and overhead shower, wash hand basin, and flush toilet. Tuition and buoyancy are supplied free of charge.